You are here: HomenextTopicsnextViews of the city: images & opinionsnextCaught on cameranext101st Birthday - twice! 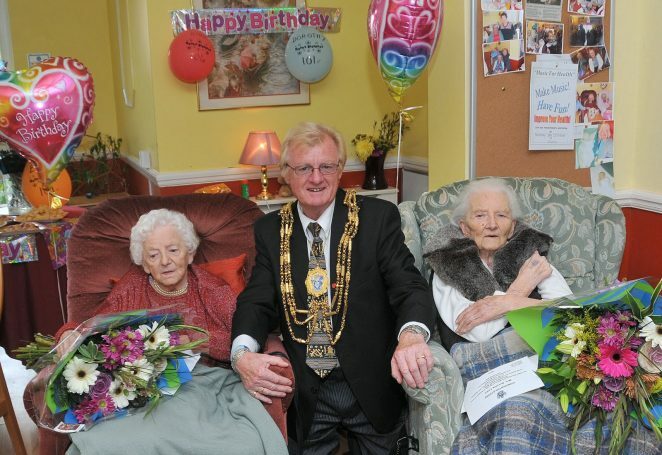 This week at the Adelaide Nursing Home in New Church Road there was a very special birthday party attended by the Mayor Councillor Geoffrey Wells. Miss Eira Varndell and Mrs Dorothy Links were both celebrating their 101st birthday and what a terrific double celebration it was. Both ladies received a lovely bunch of flowers and a certificate from the Mayor. Their good health was toasted by all with a nice cup of tea and some cake. Many happy returns to you both. Hope you had a lovely day. Best wishes, Julie.